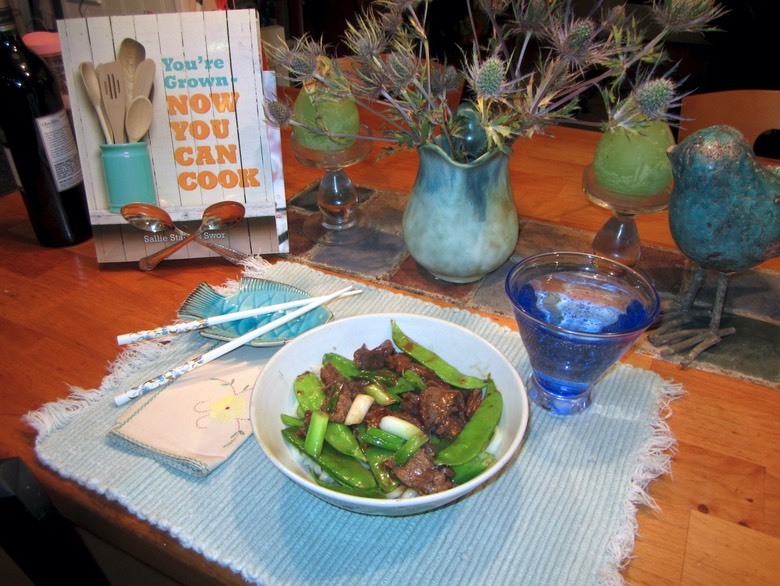 Put steak in a bowl with soy sauce, sherry, brown sugar, ginger, garlic and cornstarch. If you have time, stick this in the fridge for about 30 minutes to get a bit more flavor. Heat a large non-stick skillet, or a wok if you’re lucky enough to have one, over high heat with 1 Tbsp oil. Add green onions and fry one minute stirring. Remove to a plate. Add second Tbsp of oil and add steak, leaving most of the marinade behind in the bowl. Let meat sizzle in the skillet for a whole minute with out stirring so it will brown. Stir, add snow peas, red pepper flakes, and remaining marinade, cook for 30 more seconds.